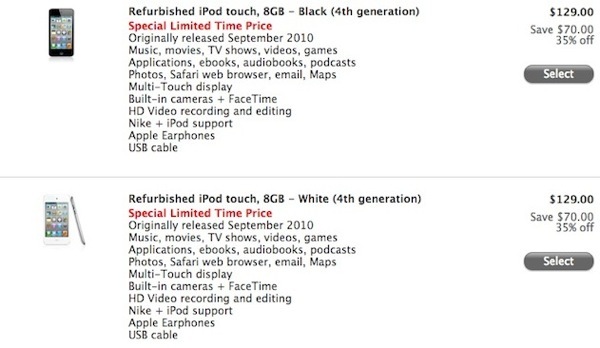 If you’re looking for a last minute Christmas gift, you might want to consider a refurbished 4th generation iPod touch as Apple.ca has restocked both white and black 8GB models for $129. These models regularly retail for $199 so at $129 (35% off) it’s a pretty good price if you require a relatively inexpensive Retina display equipped iOS device as a music player or portable computer for the kids. All refurbished iPod models also include a brand new battery and outer shell. Limited supplies, but updated frequently. Availability is guaranteed once we receive your full payment. You get a 1 year warranty, free shipping and a new battery and outer shell. Sounds like a good deal to me. Let us know if you’re going to impulsively buy this. Stocks go quickly!